First off, I just want to express gratitude at this page which is very helpful and well-maintained. I have been reading about and listening to the sarod for some time, but only received my first sarod via FedEx this morning. Very exciting! However, I now realize that my fingernails are not yet long enough to play the instrument comfortably. Also, the jabas I was sent have rather sharp edges. Should I sand them down? My main question is this: it is very difficult to play a shuddh rishabh on the sa string. I have the instrument tuned to c#, so the second string is c# and the main string is F#. For that matter, it is difficult to play tivra and shuddh ma on the main string, though for reasons I do not understand it is slightly less difficult than on the sa string. I believe the difficulty is because when getting close to the nut (I don’t know if that’s what it is called on the sarod, but the analogous part to a guitar nut) the string is bent more and the pitch rises. I am pushing the string all the way down to the metal on the neck. And there seems to be no way to play komal re on the sa string. Does this have to do with the action(height of the strings) and thus the bridge placement? Whatever advice or comments you have, I will be very appreciative of them. I also intend to get your book soon. I am a sitar player, fyi, so I am not totally new to Indian classical music. Thanks very much for the response, even while you are traveling. My strings are quite a bit higher off the neckboard than 1mm – they are a little more than 1/4 to 5/16 in high. One solution seems to be to deepen the grooves in the bridge so that the strings sit lower. If I were to do that I would use a fine saw then sand the resulting groove smooth. The site Perfect Third has a chart on sarod anatomy (http://www.perfectthird.com/sarod_tuning.htm) and suggests “between 1/4″ and 3/8” on the “Ma” string above the fret plate where it meets the skin.” As in many aspects of Indian music, this is probably attributable to differing schools of thought on the subject (though I can not see how it would be possible to play re or pa near the nut with the action that high). Since it will of course be difficult to find a sarod repairman in Philadelphia, what would you advise? I do have experience with woodworking, but the bridge looks to be made of bone. Looking forward to all your raaga explorations specially in such a vocalised context. 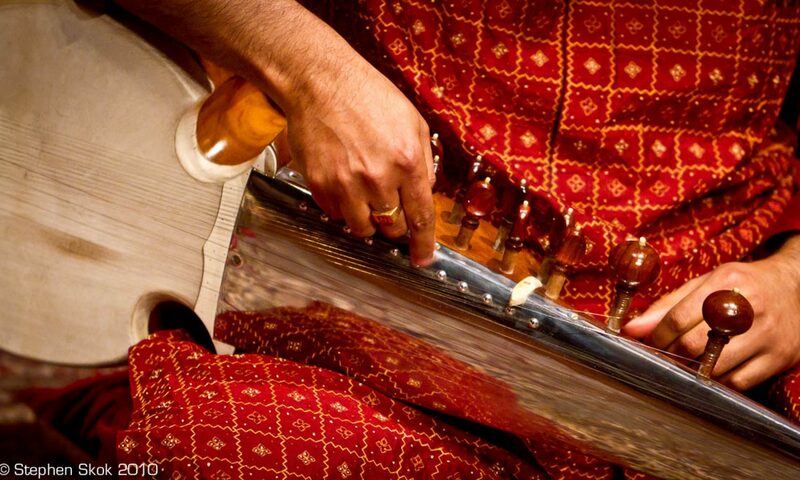 Would love to hear your thoughts on raagas such as Chhayanat, Nat Bihag, Bihagda and Kamod which are rare or considered difficult on this instrument. Ustadji’s stellar album on his vocal inspirations remains unparalleled in this regard, his Chhayanat, Jogiya and Mishra Jangla being the highlights for me. If more instrumentalists tried to break away from the dara-diri bashing (as you put it) idiom of playing and moved toward adapting these very identifiable compositions, I suppose the preservation of our music and its propagation would be ensured. The ragas that you have mentioned are difficult because melodic improvisation opportunities are limited, so any “excursion” from the main melodic line runs the risk of confusing the raga with something else. Vocal music, fortunately, provides us with an inexhaustible supply of material to draw from, solving the problem to some extent. RadhikaMohan Maitra playing the same gat that you have mentioned.